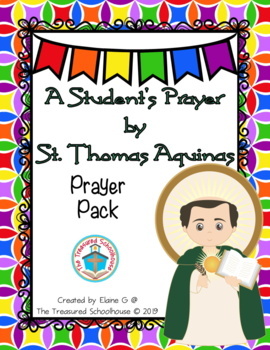 This is a prayer pack with posters, worksheets, and more for the “A Student's Prayer" by St. Thomas Aquinas. 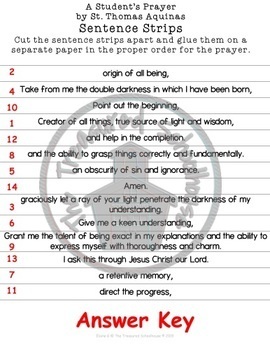 This can be used to accompany a lesson on St. Thomas Aquinas, review the prayer, or help with memorization. These make great activities while learning or refreshing the “A Student's Prayer” by St. Thomas Aquinas for a variety of ages/grades. •	Prayer Pack BUNDLE with 10 prayers covering over 125 pages at a discount of more than 25% off. If you’re short on shopping time but want or need a little something extra, please take a look at my products in the ”Bargain Bin” category. ♥ Please go to your My Purchases page (you may need to login). Beside each purchase you'll see a Provide Feedback button. Simply click it and you will be taken to a page where you can give a quick rating and leave a short comment for the product. I value your feedback. It helps me to make resources that meet your needs. ★ Look for the green star near the top of any page within my store and click it to become a follower. You will then receive customized email updates about my new products and sales. •	This product is NOT editable. •	This product uses standard U.S. spellings, unless otherwise noted. •	Custom alterations are based on current work load and other factors involved in being able to customize an item. •	Please take a minute to read the product descriptions and to view the thumbnails and previews that are provided for this product. If you have any questions or comments, leave a message in my Q&A and be sure to check the box for “Email me when the seller responds” so that you will know that I’ve replied. •	All products are for personal or for use in a single classroom ONLY. If you’re interested in sharing with your team or co-op, please “Buy Licenses to Share” at a discount of half off the original product price. •	Please make sure that you’re viewing with the most current version of Adobe Reader. The newest version is DC, but X or higher will work. Also, if you’re trying to open on a Mac, it will not open in “preview” and you will have to view in Adobe Reader If you don’t have it or need to update, please visit www.Adobe.com to download it for FREE. If you have any other technical issues after verifying and updating your version of Adobe Reader, please contact TPT support for further technical assistance, which is what they request be done. Copyright 2018 by Elaine G of "The Treasured Schoolhouse". All Rights Reserved.